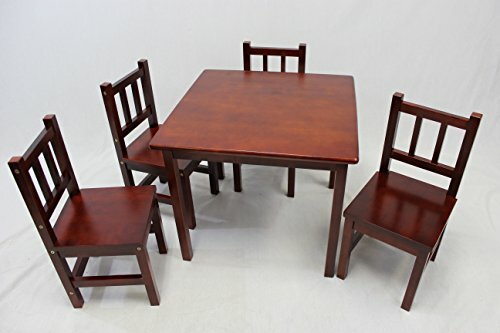 This Kids Table and Chair Set is made of solid rubber wood and finished all in Red Cherry. It is perfect for your kids for learning and entertainment activities, such as reading, painting, game playing and so on. Recommended for kids 3 - 8. Table: 20"H x 23-1/4"W x 23-1/4"D; Chairs: 22-1/2"H x10-1/2"W x10-3/4"D; Chair:Seat Height: 11-1/2" Pack: 1 table + 4 chairs; Brown box with Line Picture. Assembly is needed. It's perfect for your kids' learning and entertainment activities, such as reading, painting, school projects and more.